Election sequence: AGF Malami appears in court – Royal Times of Nigeria. The Attorney-General of the Federation, AGF, and Minister of Justice, Abubakar Malami, SAN, has said that the leadership of the National Assembly has resorted to threats and intimidation, in a bid to force the judiciary to support its move to re-order the sequence of the 2019 general election. 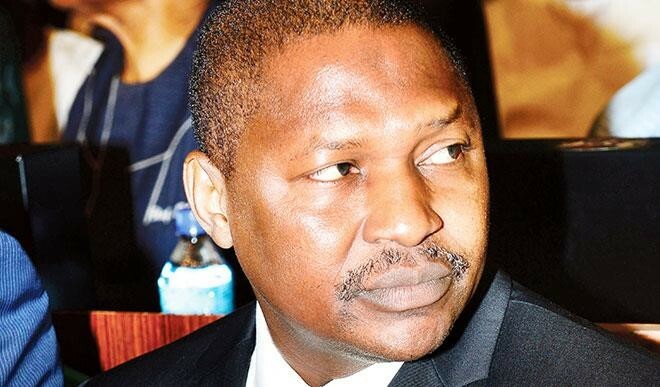 The AGF said this when he personally appeared before the Federal High Court in Abuja on Tuesday for the hearing of the suit filed by the Accord Party. The AGF berated the Upper legislative chamber, describing its response to the order the court made to preserve the Res (subject matter) of the case as a sad development. Malami tackled the lawmakers after counsel to NASS, which is the 1st defendant in the matter, J. B. Daudu, SAN, drew attention of the judge to the furore he said the preservative order the court made on March 14, generated in both national and international media. Daudu had insisted that the court order, which stopped the NASS from taking further action on the Electoral Act (Amendment) Bill, 2018, that President Muhammadu Buhari declined to assent to, has once again, placed the judiciary in the eye of the storm. Daudu made the assertion while responding to remarks by counsel to the plaintiff, Chief Wole Olanipekun, SAN, who decried that decision of the court to protect the subject matter of the case his client brought before it by asking all the parties to maintain the status quo, was grossly misconstrued in some quarters. Olanipekun said, “What happened in this court on March 14 was that though the plaintiff’s counsel applied for a preservative order in form of some injunctive reliefs, the court, in its wisdom, simply ruled and held that parties should maintain status quo antebellum. Displeased by the comments, the AGF urged the court not to allow itself to be intimidated, saying his office would support the judiciary to discharge its constitutional duties.